Ask fellow campers about "Kiser Lake State Park" and nearby attractions. Been a couple years I think since I last posted about this campground. This year they added 10 paved 50 amp Pull throughs. Most of these are 100' long sites with plenty of room for rv and toad or Pull vehicle. These 10 electric sites were added over the 2017 winter and were available for use this year. So in total there are now 20 electric sites. The other 10 electric sites are older and tighter and short. The lake is still plagued by lily pads around the edges but dredging is suppose to be on the schedule. The naturalist does a great job with the kids with all kinds of projects. If you are from out of state, there is no access fees like many states charge. If you are from Ohio and have a golden buckeye card for being 60 you can get 50% off during the week if you reserve on line. 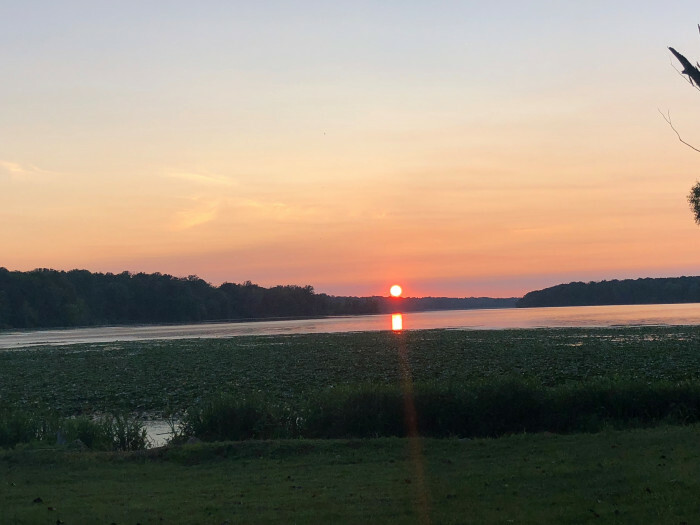 We camped at Kiser Lake State Park in a Motorhome. There are only 10 hookup sites, all pull through. All have 50 amp, no water, no sewer available. They fill up quick in the summer months so you need to reserve as soon as you know you are coming. Lake is within walking distance at about 150 yards but there are lots of lily pads along the east shore. Limited ranger patrol as this is a small lake and they work out of Springfield. The local Game Warden does patrol as well. Now the Watercraft division is seen pretty regular. Pit toilets only no showers. Dump station with potable water is available. Fishing is popular but can be tough fishing, large strippers have been caught here. Osprey are often seen diving for fish along with lots of deer and Blue Heron. There are no motors: electric or gas allowed on the lake. It is a nice scenic lake to canoe, kayak or take a row boat out on, along with sail boats. Boats are available for rent at the marina and bait store. Lake is 2.5 miles long. You can leisurely kayak around the shore in about 3 hours. 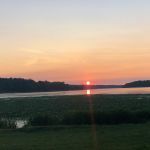 We camped at Kiser Lake State Park in a Motorhome. Piatt Castles not far away, Air Force museum 25 miles. Town of Saint Paris 5 miles, couple historic houses, the Kiser mansion is on main street and has been refurbished and the original owners were the ones who donated the land for the park. 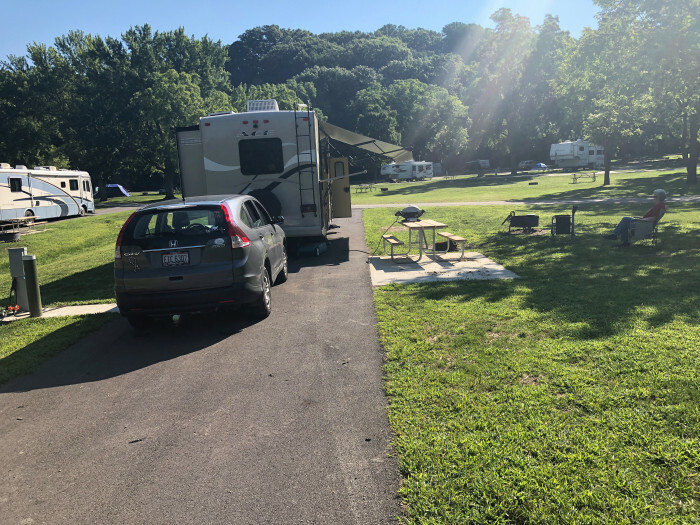 Super nice campground, so quiet. Only has ten electric sites. In off season not many of the non electric were full. I really liked that the campground was on the water and that the lake was a no motor boat lake. Helped contribute to the quiet. All bathrooms were pit toilets, no shower facilities. Very nice for a few days visit. We camped at Kiser Lake State Park in a Tent Trailer. We stayed here with two grandsons over the 4th of July weekend. We camped in a large site on the lake so that my husband and the kids could fish, and for the view of the lake. The lake front sites are across the main road from the rest of the campground. None of them have hook-ups of any kind. Everyone just parks their campers in the grass in that area. We took a couple walks through the main area of the campground. The sites on that side were mostly shady, but most were very small. It was a holiday weekend, so the park was full and crowded. Only 10 of the sites have electricity. 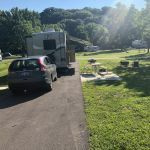 There is no running water at the campground, only a continuous flow of water from an Artesian well located near the marina. Bathrooms are pit toilets, and in the heat of summer they were utterly disgusting. The smell and the flies kept us out of them, and we used our Luggable Loo inside our shower tent. We also brought along a solar shower since there are no showers at the park. This lake has a no motor policy, and attracts many fishermen. We rented a small human-powered fishing boat, and were able to keep it at our campsite for the weekend. There were park personnel conducting many activities for the kids throughout the weekend. There were also movies available for them in the evenings. All the staff was very friendly and helpful. This campground seems to attract a more rowdy crowd than we normally enjoy camping with. People were just running through and actually coming to our campsite to fish. There is no privacy. I realize that it was a holiday weekend, but I had the impression that this is the way it is at this park. I don't think we'll go back. We camped at Kiser Lake State Park in a Tent Trailer. Are you affiliated with Kiser Lake State Park ?